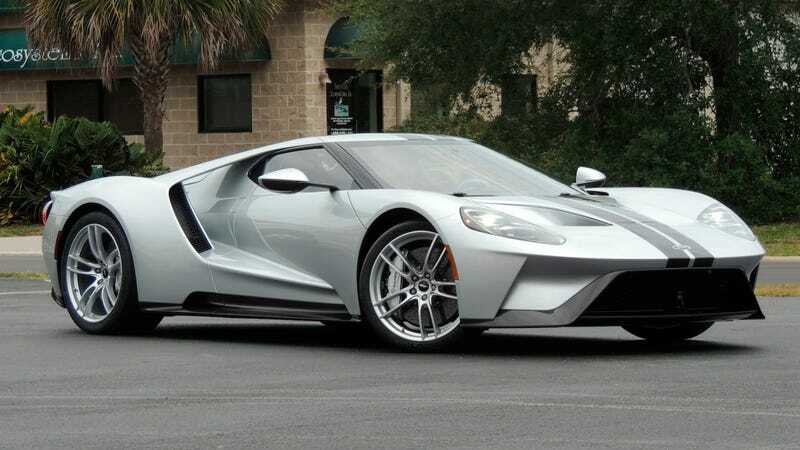 The current-generation Ford GT supercar comes, in addition to a $450,000 base MSRP, with the agreement that anyone chosen to buy the car can’t resell it for at least two years. Ford’s filed lawsuits over GTs that have slipped through, and a recent lawsuit settlement means one of America’s biggest auction houses can no longer resell GTs still in that two-year window without Ford’s blessing. Ford announced the details of the settlement, which went through the Indiana court system in November of last year, on Thursday. Ford said the settlement “clears up any lingering confusion” around the ownership and resale agreement for the current generation of the GT, and it also means Mecum has a lot more restrictions on what kind of GTs it can accept for future auctions. Ford and Mecum are keeping the details and numbers of the settlement quiet, but Ford went public with the important part—the part that says the company is sticking by its agreement that bars owners from reselling for their first two years of ownership, and that car sellers better heed it, too. 3. Settlement proceeds from Mecum will be donated to the Ford Motor Company Fund. When asked if there were any special circumstances that Ford would grant an auction with Mecum under, from a seller other than itself, a representative for Ford declined to comment on hypotheticals. Mecum isn’t the only entity that’s gone to court with Ford over the original sale or resale of a new GT. Ford’s lawsuits also included ones against John Cena and a California car dealership, both of which were settled in the summer of 2018. This iteration of the resale-lawsuit pattern began when a silver 2017 Ford GT with black racing stripes showed up on the Mecum website, headed to auction in Indianapolis in May of last year with seven miles on the odometer. The GT was still under the agreement its original owner signed with Ford over not reselling it within two years of delivery, obviously, but it was for sale nonetheless. Ford filed against Mecum in Indiana’s Marion County Commercial Court on May 17, 2018, the weekend the car was scheduled to auction, along other defendants: Michael J. Flynn Jr. and his company Hollywood Wheels, which bought the car from its original owner, listed as John W. Miller in the original lawsuit. But the car sold anyway—a bidding war went to nearly $2 million, or quadruple its base MSRP. The same GT went back up for sale at Mecum in August and got a high bid of $1.6 million, this time with eight miles on the clock. The auction prices for the GTs might seem high, given that production is still going on and that it’s a new car. But Ford has a strict application program for the car, which thousands of people have participated in but only a few hundred have been deemed worthy of, from an ownership and influencer perspective. When the time came to sell the GT in Indianapolis, a Mecum representative said over the mic that a judge ruled Mecum could sell the car, “and if Ford wanted it back, they were welcome to come here and bid on it.” The rep went on to say the sale was legal, and that there would be no repercussions for buying it. The contest in Marion County Commercial Court went on for months after that, though, with the state court system recording that it was settled in November of 2018. Mecum declined to comment on the settlement when it happened, and Ford didn’t respond to Jalopnik’s request for comment at the time. That’s a far cry from buying and selling “what you want,” but an agreement is an agreement, nonetheless.